Authorities in Beijing have warned that heavy pollution will persist in China's capital this week, urging the suspension of outdoor school activities and construction projects. The warning came in the form of an orange alert, the second highest in a four-tier system. The alert signifies there will be three consecutive days of smog at particularly dangerous levels on Beijing's air quality index, starting on Thursday. 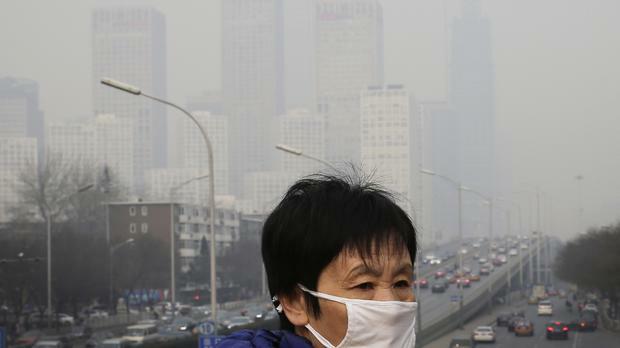 A red alert is issued if pollution is forecast to persist for more than three days. Kindergartens and primary and middle schools were advised to cancel outdoor activities. There was no word on such an advisory for Beijing's high schools, which focus mainly on indoor test preparation. Construction sites which dot the ever-expanding city were targeted by authorities for the exhaust, dust and other pollution they add to the already toxic mix in the air. Launched three years ago amid rising public concern, the warning system is one way authorities are attempting to clean up China's dirty air after decades of breakneck economic growth that led to the construction of hundreds of coal-fired power plants and soaring car ownership. Authorities say they are making progress. Environmental officials in Beijing said on Monday that a key indicator of poor air quality - the density of the particulate matter PM2.5 - decreased in the first 10 months year on year. Also on Monday, environmental campaign group Greenpeace East Asia reported that levels of the heavy metals arsenic, cadmium and lead in the PM2.5 in Beijing had fallen rapidly since 2013. It said the decline was directly linked to the closure of coal-fired power plants around the city. The Beijing Municipal Environmental Monitoring Centre acknowledged that the city's air was likely to worsen as the coal-powered winter heating system kicks in across northern China.